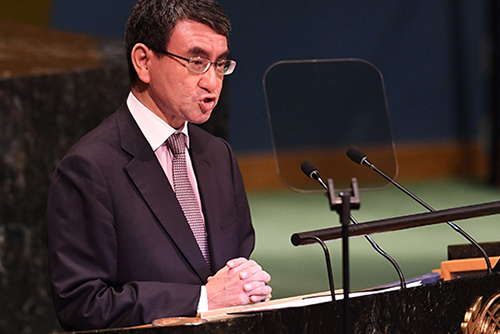 Japanese Foreign Minister Taro Kono has criticized South Korean National Assembly Speaker Moon Hee-sang over his remark that Emperor Akihito should apologize to South Koreans for his country’s wartime atrocities. According to Japanese media outlets, Kono met with reporters during his visit to the Philippines on Monday and said Assembly Speaker Moon should be careful about what he says. Kono claimed the issue of Japan’s wartime sexual slavery was addressed completely and finally based on an agreement between the two countries. He noted that Seoul was not calling for renegotiation of the agreement, but said Moon should speak with what he called “right perception” of the situation. He claimed he heard from the South Korean government that the speaker’s remarks were reported differently from his intentions. In an interview with Bloomberg on Friday, Assembly Speaker Moon said Akihito should deliver the apology before he abdicates in April, adding he is the son of the main culprit of Japan's war crimes.